Indianapolis Rotary Club packs backpacks for veterans | HVAF of Indiana, Inc.
As a way to carry out their motto “Service Above Self,” the Indianapolis Rotary Club packed backpacks for Indianapolis’ homeless veteran population. Last year, they packed 144 backpacks, and packed 180 this year! 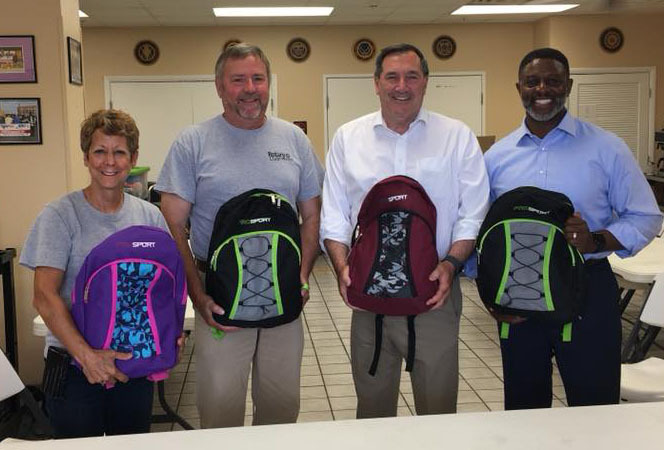 HVAF was also blessed to have Senator Joe Donnelly come to HVAF Headquarters and help some of the Rotarians pass out the backpacks to some veterans! Another successful Operation Alpha: HVAF raises $37,000 thanks to your support! ARE YOU A VETERAN IN NEED? © 2019 HVAF of Indiana. All Rights Reserved.